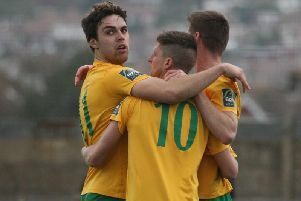 Horsham defender Joey Taylor has left to club to join Bostik League South East Division rivals Hythe Town. The former Welling full-back joined the Hornets in the summer, but has found game time limited in the past few months despite having made appearance for his country this season. Taylor had made three appearance for Montserrat this year and played in both of their CONCACAF qualifying matches - of which their final game is against the Cayman Islands next month. Having made 12 starts this season, his last came back in November having lost his place to mid-season signing Harvey Sparks. Taylor has left in search of regular football with manager Dominic Di Paola explaining: "It was difficult for Joey. He’s a very good player but Harvey Sparks has been in terrific form so its hard for me to give him first team football at the moment. Taylor was the first-ever player to graduate from Welling United’s development squad, signing a contract at the National League side in 2015 and went on to make ten first-team appearances. He has also played for East Grinstead Town, Leatherhead, Burgess Hill and VCD Athletic.